Hey guys, I’m so excited to share my new outdoor furniture with you today! I have a lovely and enormous deck that I will tell you all about someday when I finish it (still gotta get those pesky railings done and stain it this fall) so you’re just gonna have to believe me for now when I say its wonderful but its been a waste land since I moved in. Outdoor furniture is expensive! And it was NOT in my budget. So, I’ve been keeping an eye and ear out for something I could buy and refinish. 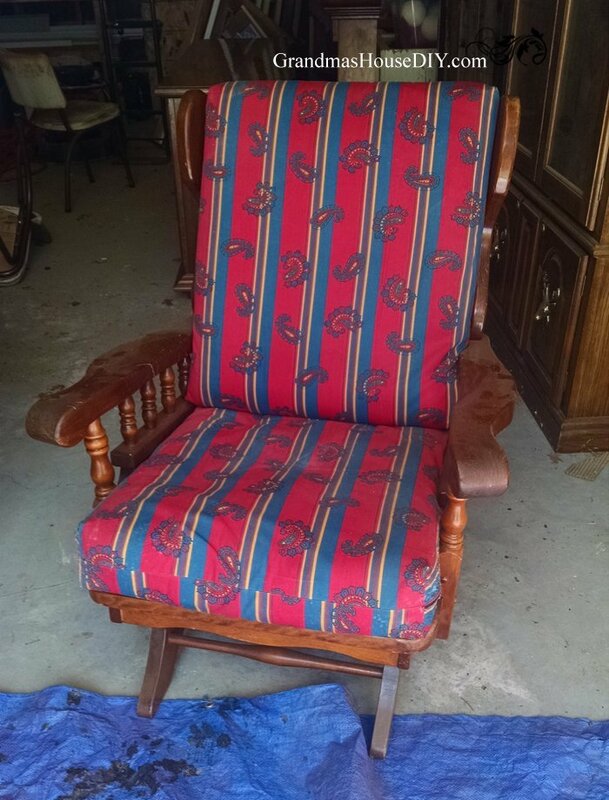 Remember when I mentioned scoring a bunch of furniture at an estate sale a couple months ago? Yup I finally finished it for my deck! 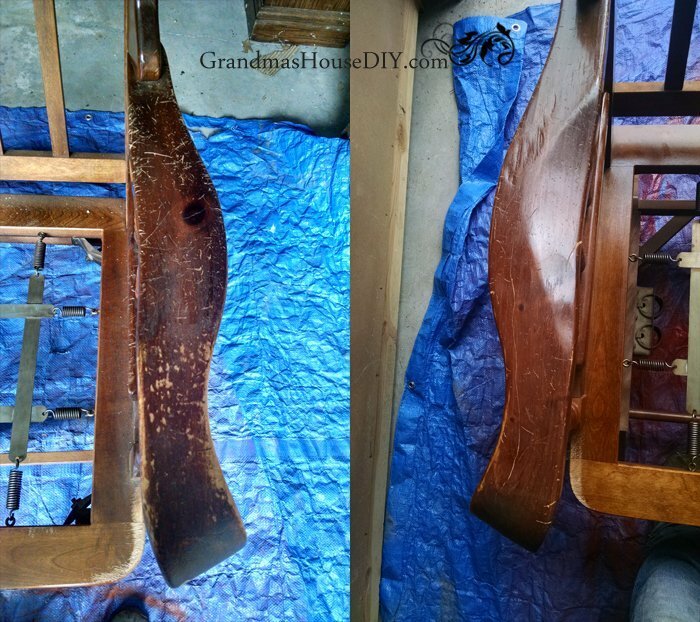 Once the furniture was finished drying (on day three of endless painting) I had one major problem to solve. Out door cushions are expensive too! The real shame was that I could not use the cushions that came with the set outside as they were incredibly thick and very comfortable. However, they would become giant sponges in the rain – no go. So I had to come up with outdoor cushions I could afford. Walmart saved the day. After endless searching on Amazon I ran into the walmart website and could not believe it – these cushions were HALF of the price of anything else I could find online! So I went to my own local walmart and, low and behold, there were four color choices and at only $14.99 a cushion I could afford them. 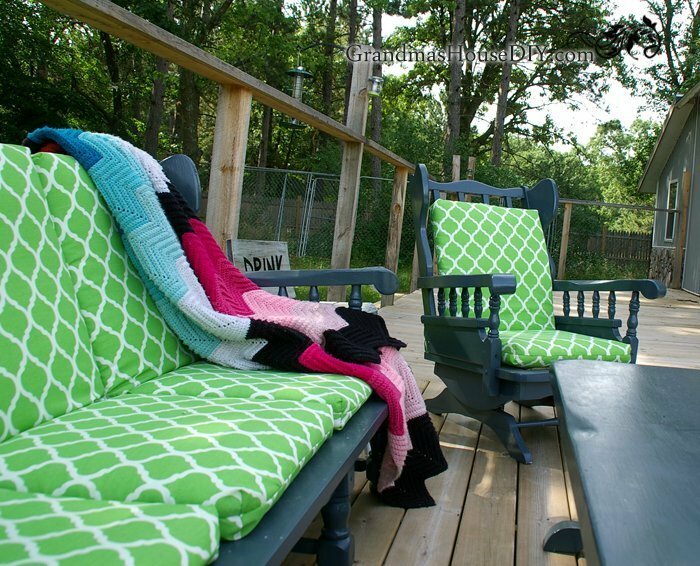 I ended up with the green because I thought it would make an interesting mix with the blue/gray I painted the furniture and it brings out the green in the cushions of our red wicker chairs that now share the deck with this new set of outdoor furniture. Remember my extra seating/end tables I fixed up with barn wood and spray paint? Yup this was the set of outdoor furniture I needed them for! The missing end table “Be Merry” is not far away with the red wicker chairs. I still have a ways to go on my deck but now I have some great places to sit and enjoy my back yard! What a job! They turned out wonderful! I feel the same way about painting and I can’t imagine with a set this large! Not too long ago I bought a simple, cheap, paint sprayer from Harbor Freight (2 actually) for $10 each with a coupon but, it only cost $15 I think, regularly. I don’t use it all the time but, it sure is nice to have on hand. Angie I definitely need to get myself a paint sprayer! lol! Thanks for coming by, I’ll have to look and see if I can find some that are that inexpensive. 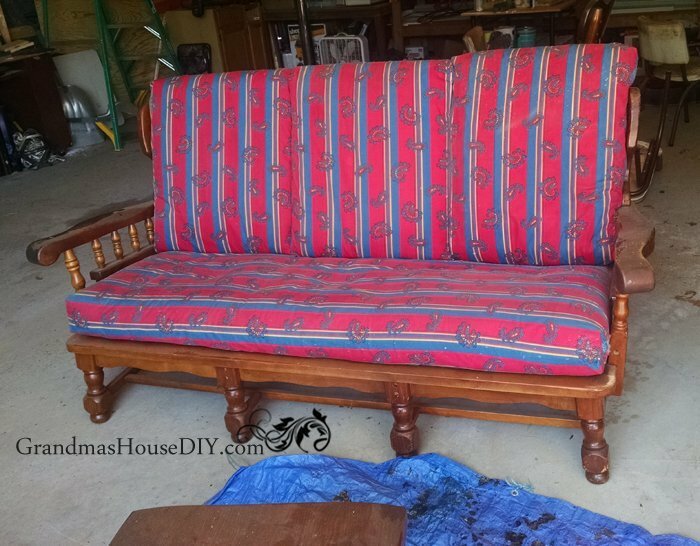 You did a fabulous job with old sofa structure. You turned them out a set of new sofa and loved the green color of cushions. So very happy for you. What a wonderful job and so rewarding when you are done. Again, we can not wait to see it in person! Carol, thank you 🙂 can’t wait for you to see everything! I love this! I’ve been keeping my eye out on craigslist for something similar for a while! Love the way they turned out. Thank you Kaylee! I almost bought a paint sprayer after this project but even after all that painting it was totally worth it! What a totally beautiful transformation!! Inspires me! Thanks for sharing on the Pleasures of the NW’s DIY party! This turned out so so pretty, i love the fresh colour you chose for those cushions and how they go with the rest of the furniture pieces! Lovely! Thank you so much Katrin! I really struggled on deciding on those cushions, there were several to choose from but the green really grew on mw! Wow! These turned out beautifully. I love repurposing old things into something new an useful. Such a lovely sitting area on your deck. You’re making me wish for warm weather again, Tarahlynn! 🙂 Thank you for linking up to Funtastic Friday, Happy Thanksgiving! Kimm, I feel the same way! Winter just got here in a BIG way and I already miss summer!! I would never have thought to do that. Love how it turned out! So cute!! Thanks for sharing with SYC. I’ve been wanting to have more ‘indoor’ style furniture in our outdoor spaces. Would love to see a follow-up post next spring or summer to see how they held up over a full year. Thanks so much for sharing at the #happynowlinkup! Thanks Leslie, I will definitely write a follow up! This looks great!! 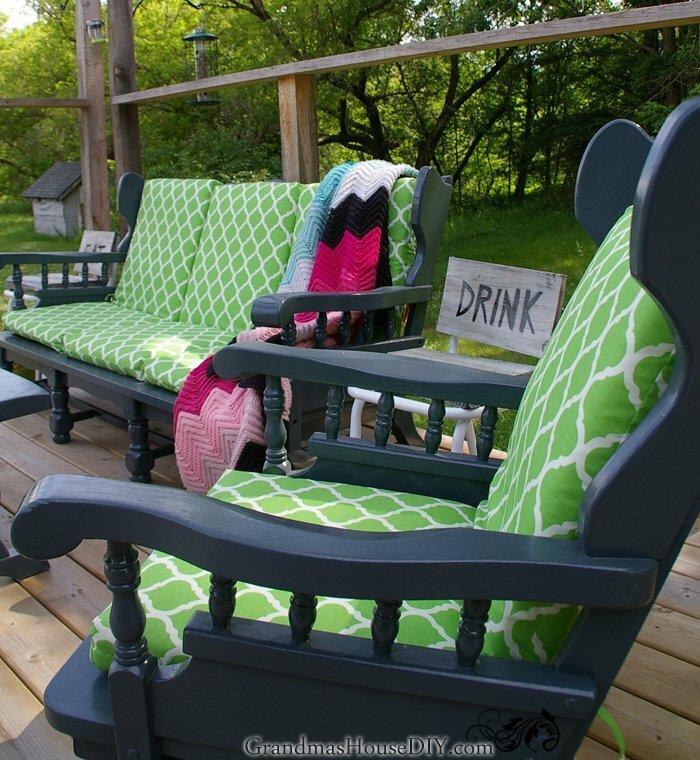 I need some new furniture for my screened in porch and this has given me the inspiration I needed to get going on that! Thanks for sharing at the Family Joy Blog Link Party this week!! 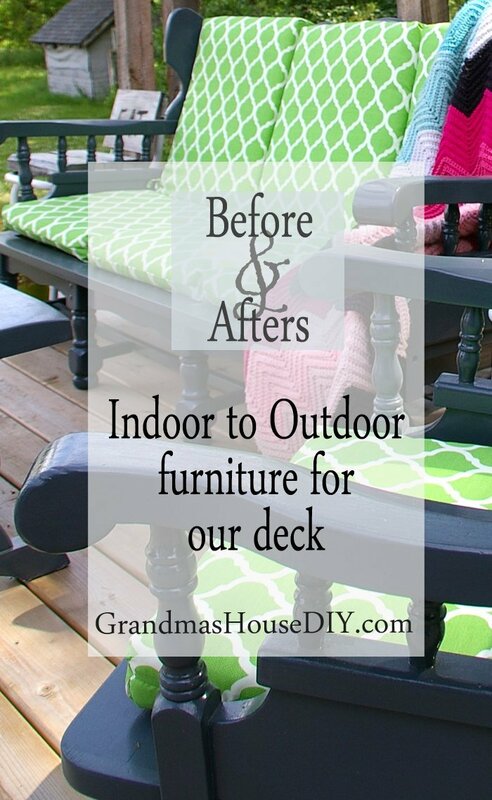 Melissa, some old wooden furniture would be just perfect for a screened in porch! Thanks for coming by!! Hey Julie, thanks for coming by and commenting! Someday I’m going to get myself a paint sprayer so projects like this one won’t be so dang labor intensive! Love!!!!!! 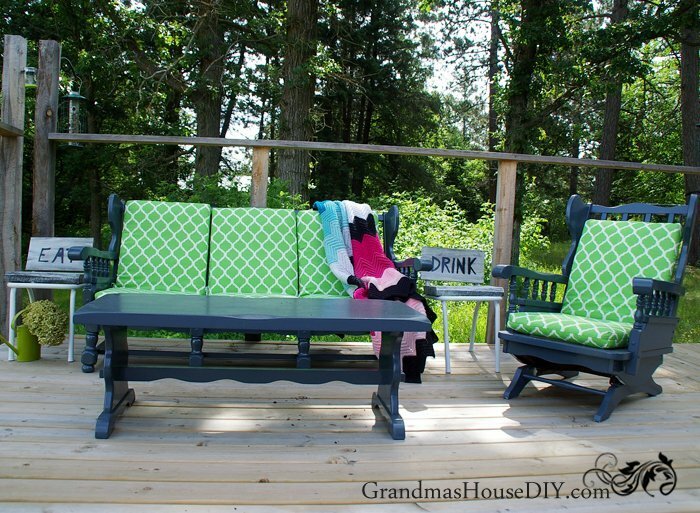 Great idea, and they look wonderful on your deck. I’m sure you will enjoy them for a long, long time!! Thank you so much Kathy!! Can’t wait for spring so we can enjoy them again! It all looks brand new. Awesome! Such a great idea Tarah. Just love all of it. Surely, you’ll enjoy to have those chairs. Thanks for sharing your beautiful ideas. Do you leave these outside? How do they hold up? Hey Bekah! Its been a year now and I wish I had thrown a tarp over them (our winters are brutal here in northern MN!) The coffee table and chair have almost no wear and tear but the sofa lost a little paint in a couple of places 🙁 But, all in, I would say they definitely survived pretty well considering! Hope to turn it into a lovely outdoor eating set. I do not mind painting, but that was a lot of coats for priming. That’s great! Good luck on your pieces! Love the transformation! Thanks for sharing at the Friday at the Fire Station link-up! These look great. 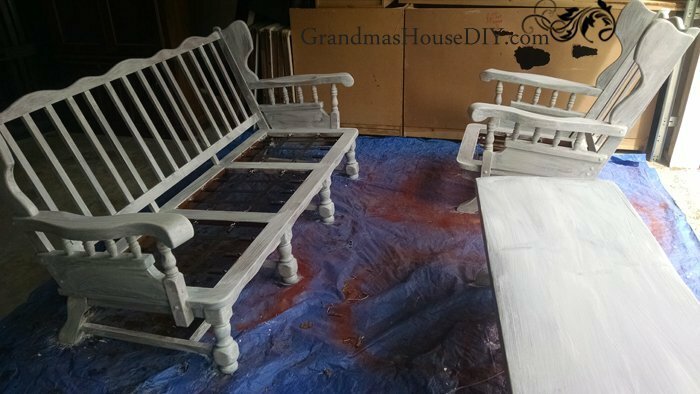 I would have never thought to turn indoor furniture to outdoor with the exterior paint. What a brilliant idea! So glad you shared this. That is an amazing transformation! 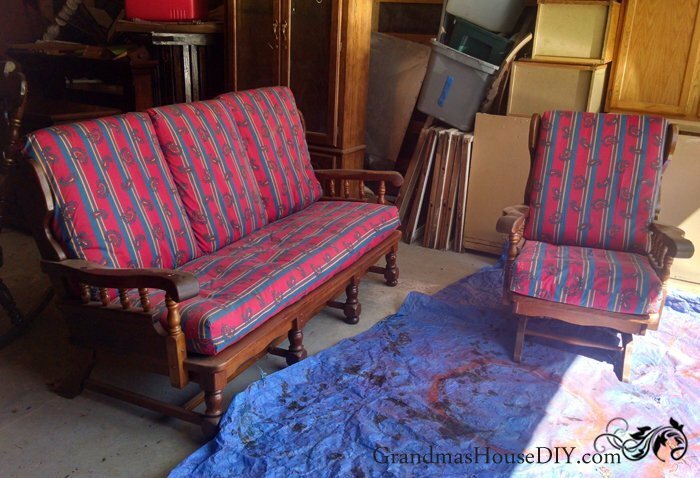 Great way to use old furniture you can’t use inside. Visiting from Friday at the Firestation party. Thank you so much Victoria, have a great weekend! These look so good! I love the color scheme of it all. Too cute! Those are gorgeous!! 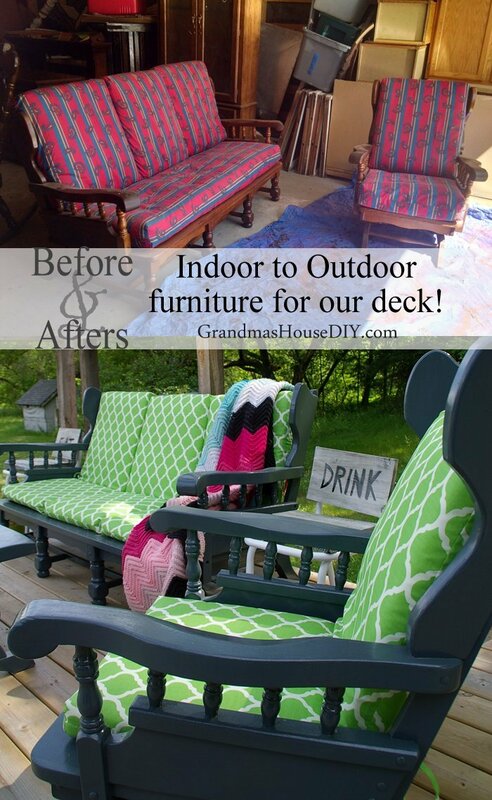 What a wonderful idea to re-purpose indoor furniture for outside. Oh for sure, wow I am definitely going to invest in a sprayer before I tackle a project this big again! So pretty! You did a great job there. Love the new colors. Thank you for sharing at The Really Crafty Link Party. Pinned!